Gary Simmons depicts sites of movement as static objects, fixating on the hard truths and memories that emerge in moments of pause. 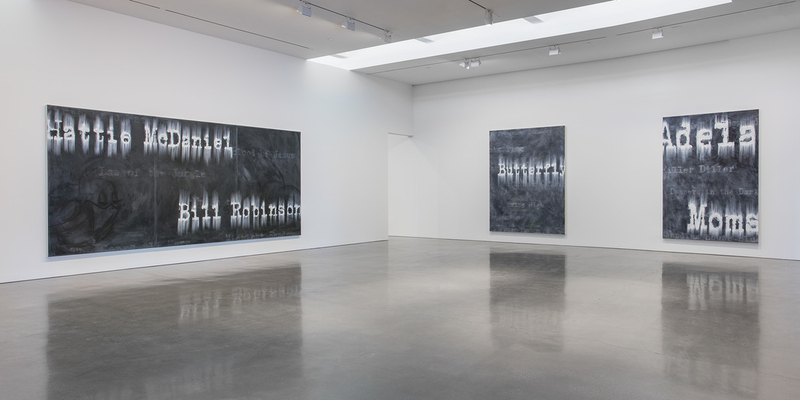 Smudged white chalky titles of early silent picture shows, talkies, and names of yesteryear’s famous African American film stars appear on black canvases, rolling credits emblazoned and blurry like the projection of a stuck celluloid film strip. The name of actress Hattie McDaniel, best known for her controversial, Oscar-winning role as Mammy in Gone With the Wind (1939), graces a canvas titled Law of the Jungle (all works 2017), alongside one of Bill Robinson, contentiously remembered for his performances in minstrel shows and vaudeville earlier in his career. These monikers share more than a marquee; vilified for what they represent from the past, they bear the albatross of American cinema’s racist stereotyping. Simmons likewise paints lesser-known black entertainers, and the titles of feature films they starred in, in varying states of legibility—words seem to appear and disappear quickly, like the afterthought of a credit reel for the few who stick around for it. These captions call forth the ghosts of fraught, forgotten, or disappeared histories, demonstrating that the haziness of time can distort—or worse—erase. A life-size staircase, Balcony Seating Only, that bears the word colored floats along a nearby wall. The interior architectural fragment was built to resemble the Jim Crow–era back stairs in movie theaters that African Americans climbed to their segregated balcony seating. Yet this piece leads nowhere, a passageway rendered inoperable. Confronting viewers with the physical signage of segregation in space, the artist amplifies this difficult narrative not simply about the history of cinema but about the United States. One wonders if even McDaniel and Robinson watched their own pictures from this relegated vantage point.